Wella System Professional Repair Mask is the perfect solution for dull and damaged hair. Its regenerative formula gives the hair renewed resistance, repairs, nourishes and instantly gives it long term protection. The Repair range is designed for damaged hair which can be easily identified as hair that looks dull, straw like, is limp and lacks vitality. Is very difficult to comb and is porous with a tendency towards split ends. 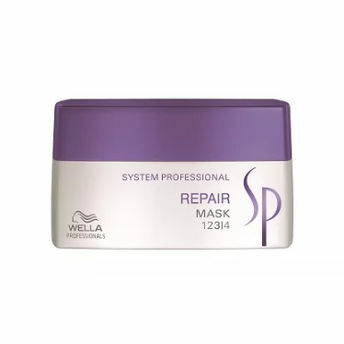 The repair line consists of newly added Hydrolyzed Keratin protein to restore and repair internal structure of the hair. High level of conditioning agents to nourish the hair and a new generation of silicones and cationic agents to create a smooth & balanced structure.